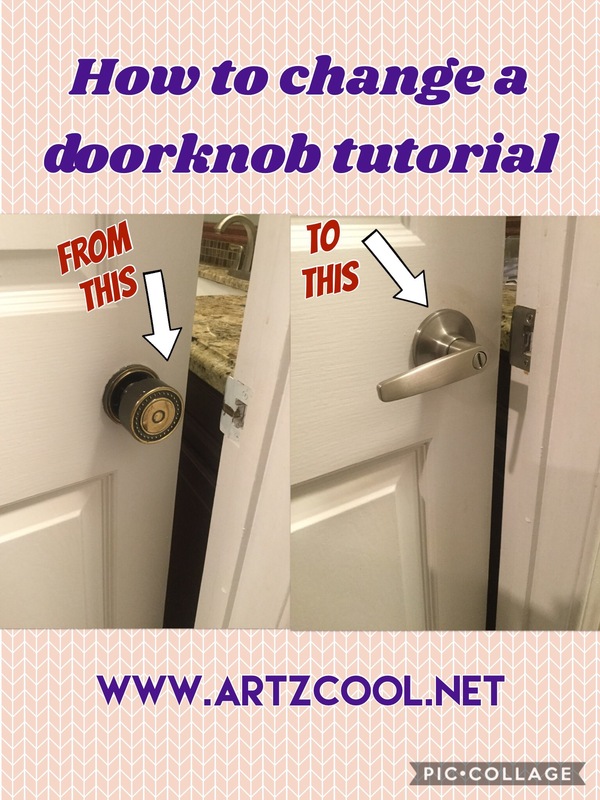 How to change a doorknob | ARTZCOOL'S BLOG! 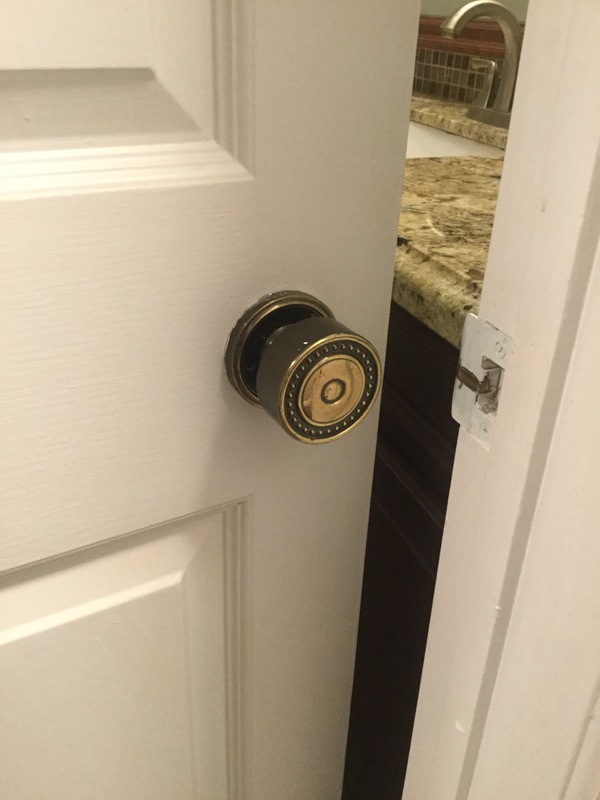 I’ve been meaning to do this since we moved in, because I disliked our brass doorknobs from day one. 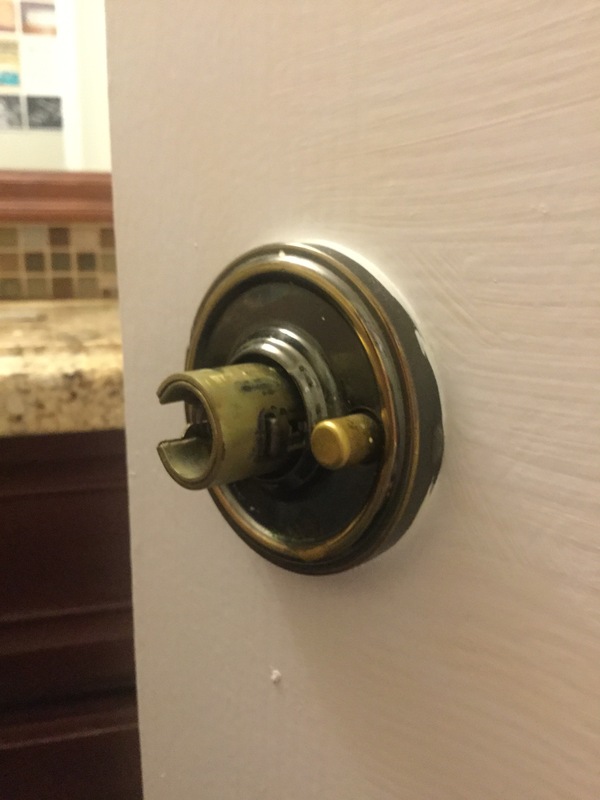 Our house was built in the late 1970’s, and I’m sure these brass doorknobs were stylish then, but not only were they outdated in terms of style, but they also were coated with a wide variety of paint accumulated over the years. 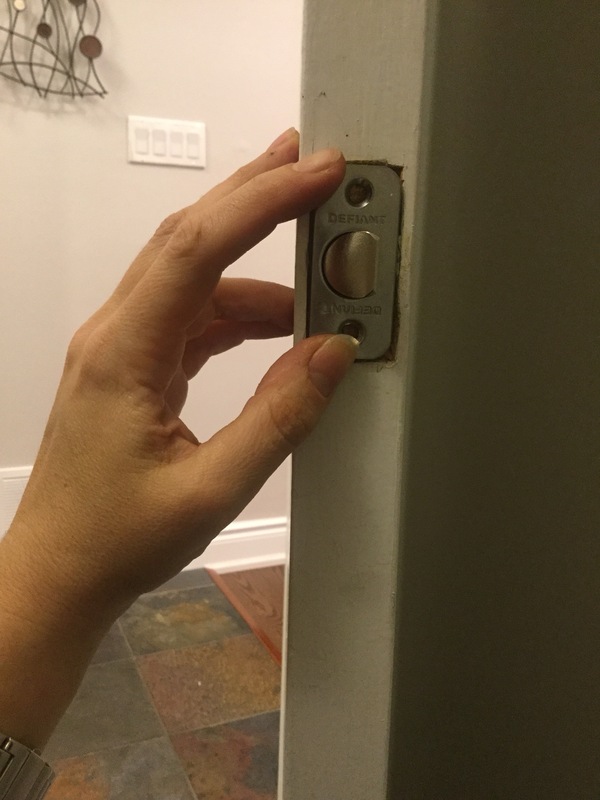 So door handles are pretty easy to find, at Home Depot and most building stores. 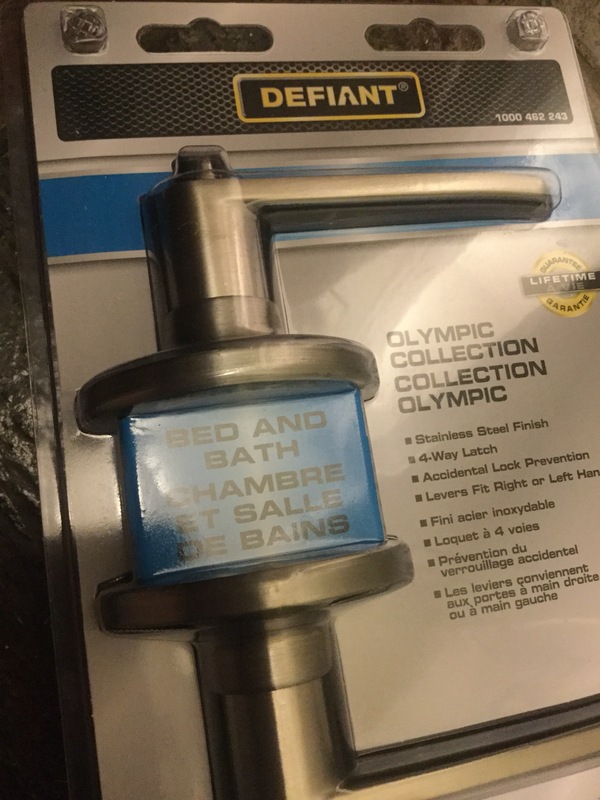 You can buy locking or nonlocking handles, and they also come in builders pack, of four handles. I opted for the brushed silver option. I will say that there is a bit of a learning curve to this, which is why I though I would share. 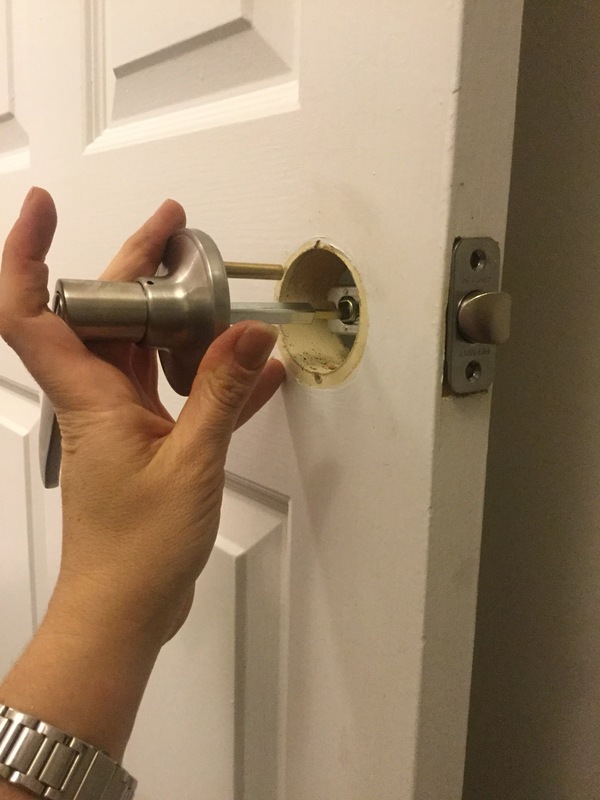 My first attempt ended up me locking myself in a bedroom and I had to call John to get a screwdriver to pry the door open. Lol. 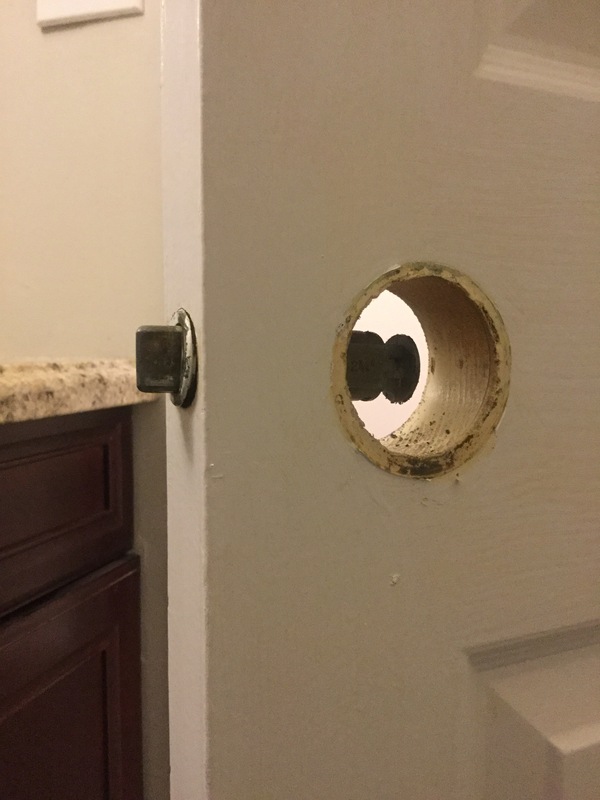 Anyways, start by taking the knob off by sticking a screwdriver in the little tab to release the knob. 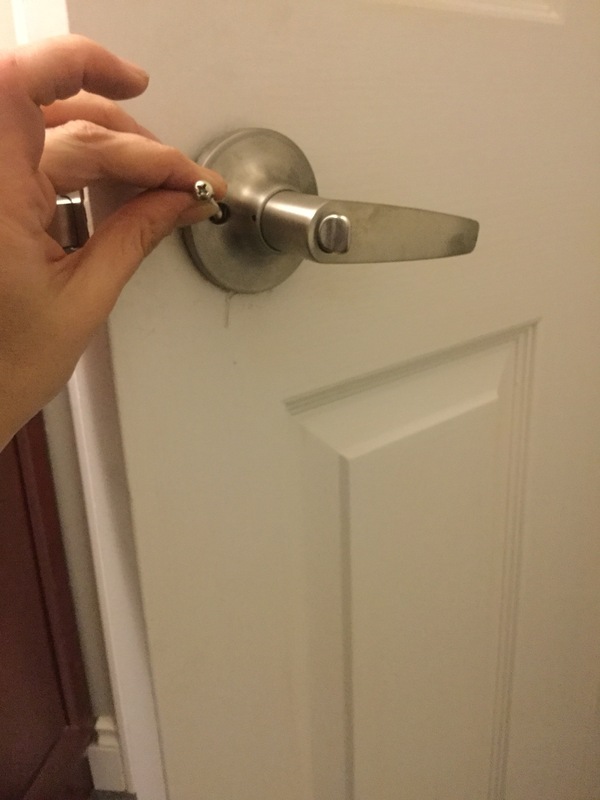 It is usually found on the back of the door handle. You can see the little tab under my finger. 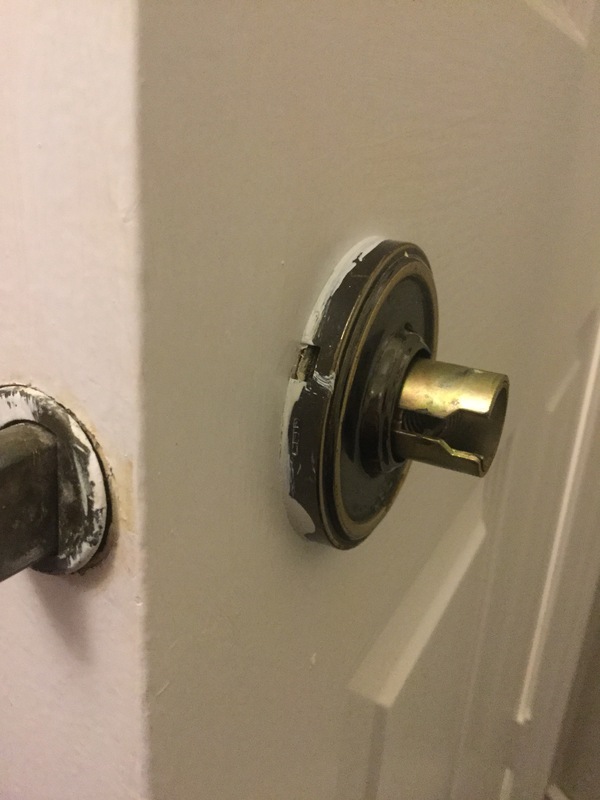 Then, there should be another little slot to pop off the faceplace thing with a screwdriver (this step took me ages to figure out btw) you can see the lovely accumulation of paint on this doorknob… this is one of the better ones. 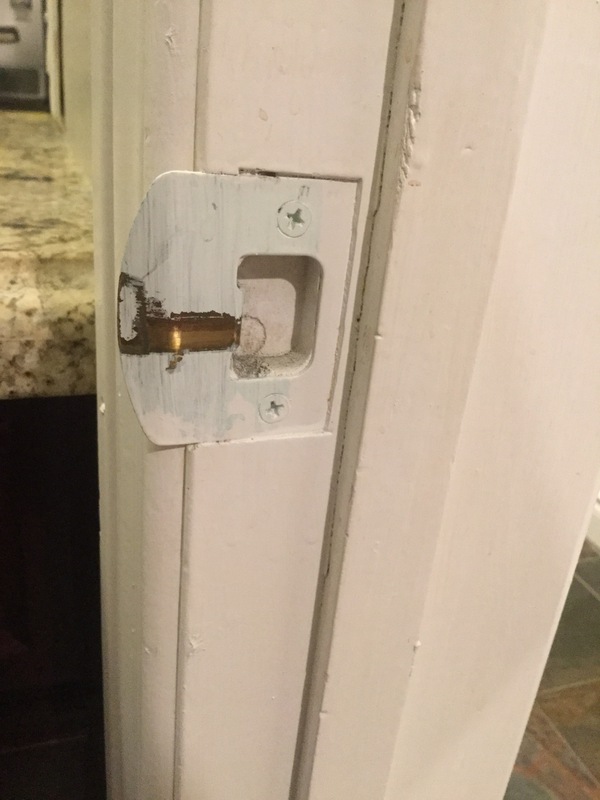 Then once you have the plate off, you unscrew the two screws. And then pull on the front and back to take the whole assembly apart. Then, you are left with the middle part, which may, or may not, pull out easily. 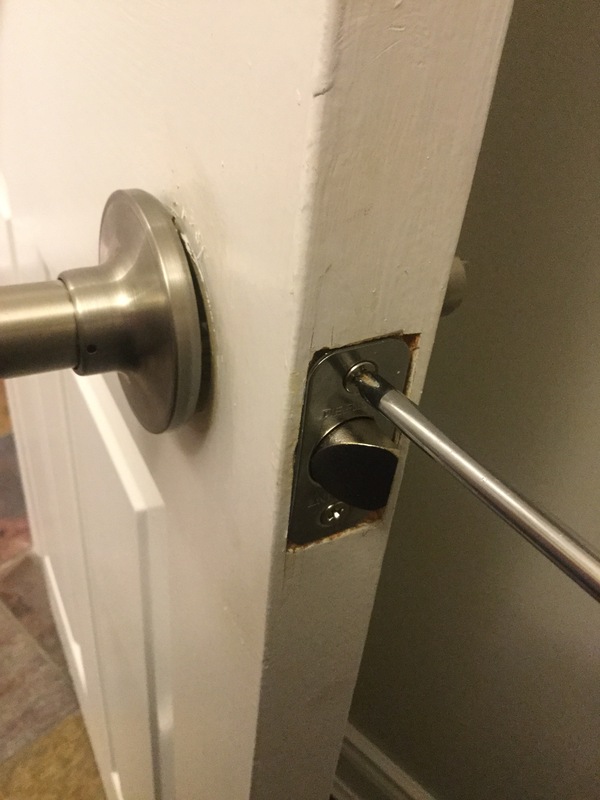 I had to use pliers on a couple doors. 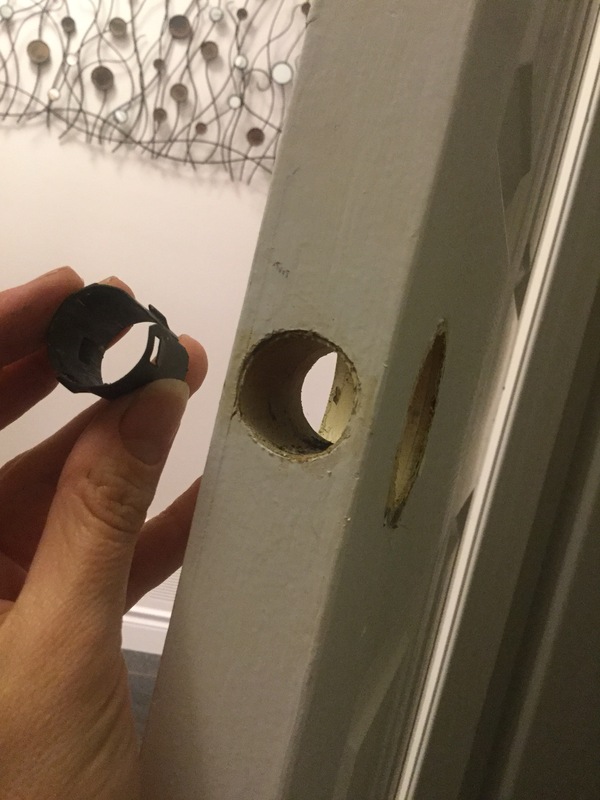 Be careful to look inside, because a few of our doors also had this metal cylinder inside. 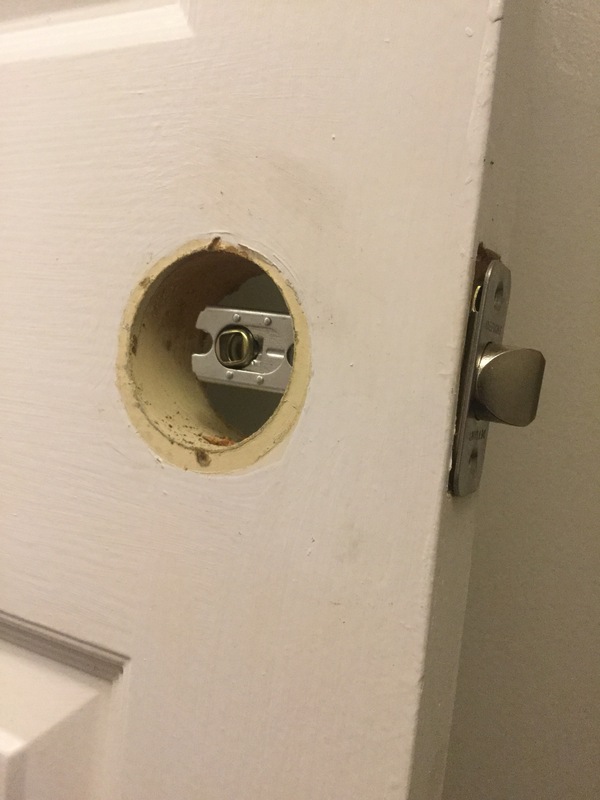 You can’t fit the new lock inside if you don’t remove this. 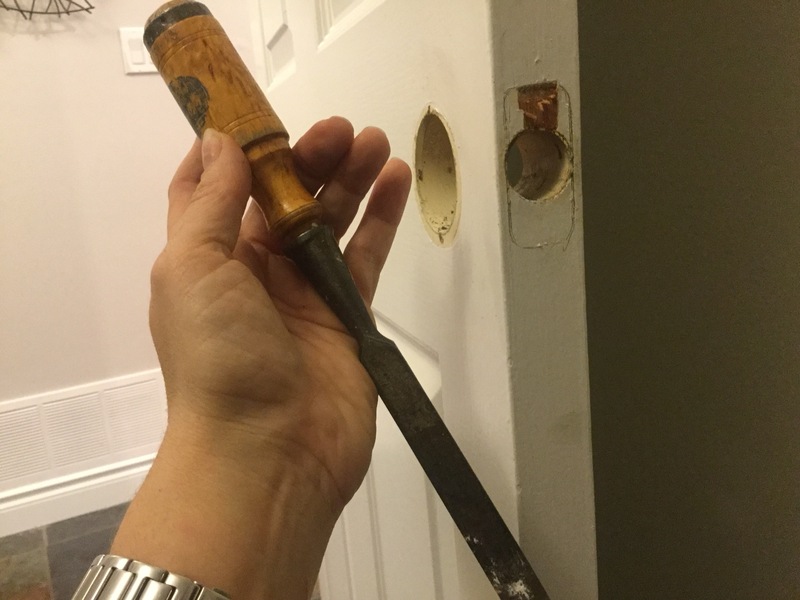 So, trace around the piece (sorry, have no idea what it’s called) with a pencil, and use the hammer and chisel to remove some of the wood. Tip: chisel around the edges first, so the wood doesn’t splinter. 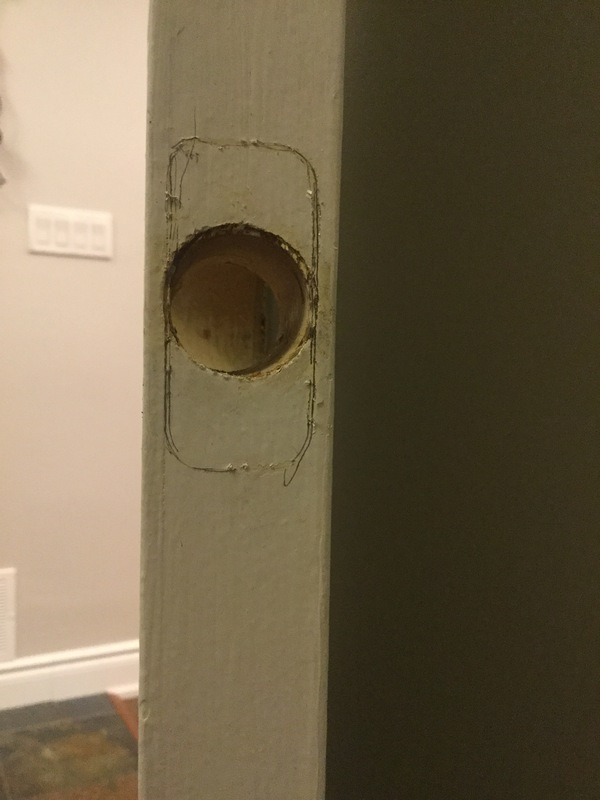 Keep trying the piece, the goal is for it to sit flush with the doorframe. 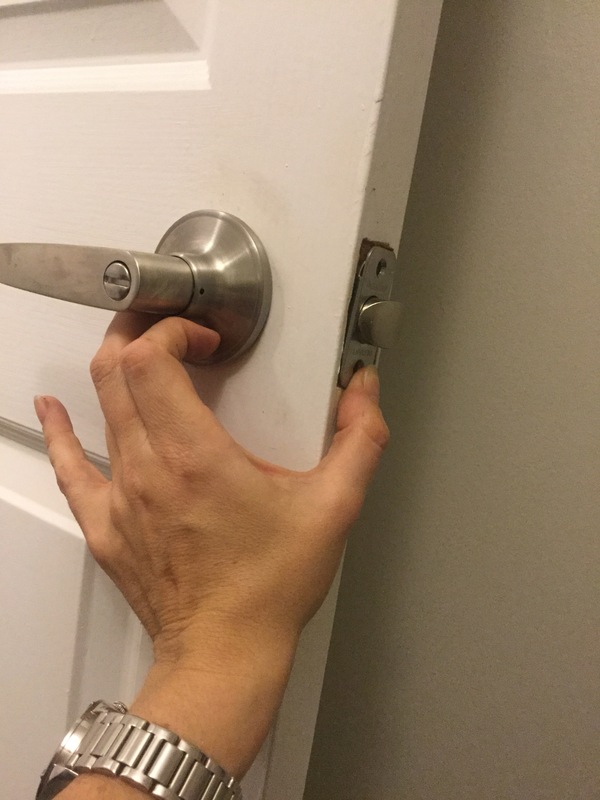 If it is sticking out, the door won’t close properly. Important note here! 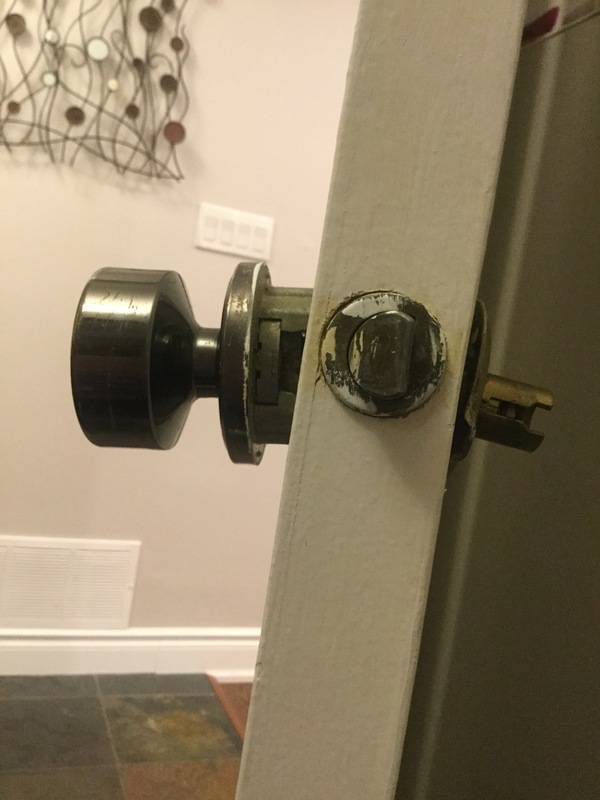 Be sure that the angled part is facing the door jam. 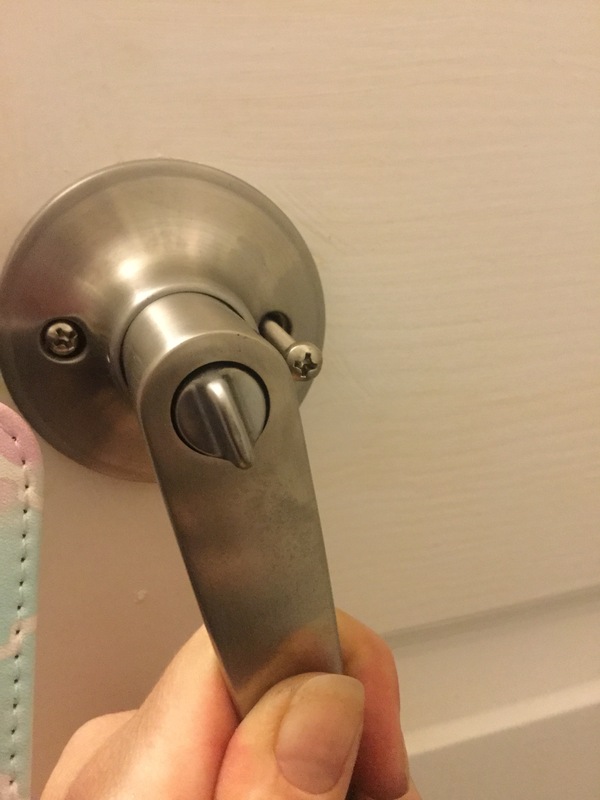 If you put this part in backwards, you will be locked in (yes, this is the part where I learned from experience) When the door closes, it has to push that lever in, (sorry, one again, I’m not familiar with the doorknob lingo) so it has to be angled towards the door frame, not the flat side. 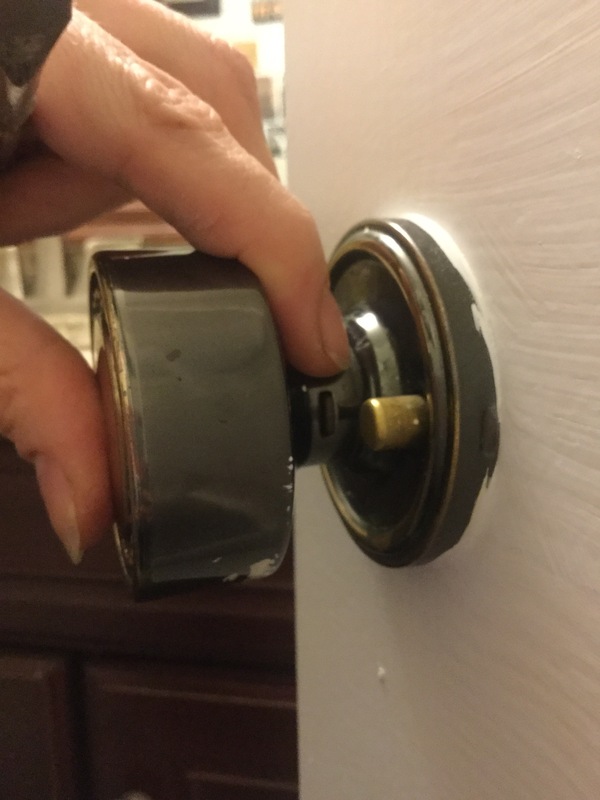 And, once you put it on, on the back of the door handle, there should be two more screws that are longer and will attach the front of the knob to the back. 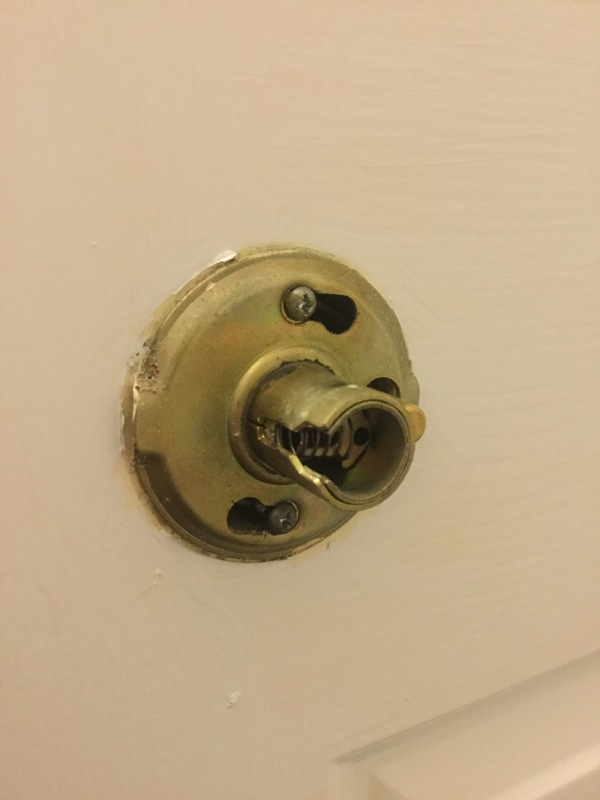 You will have to move the door handle to get the second screw in. 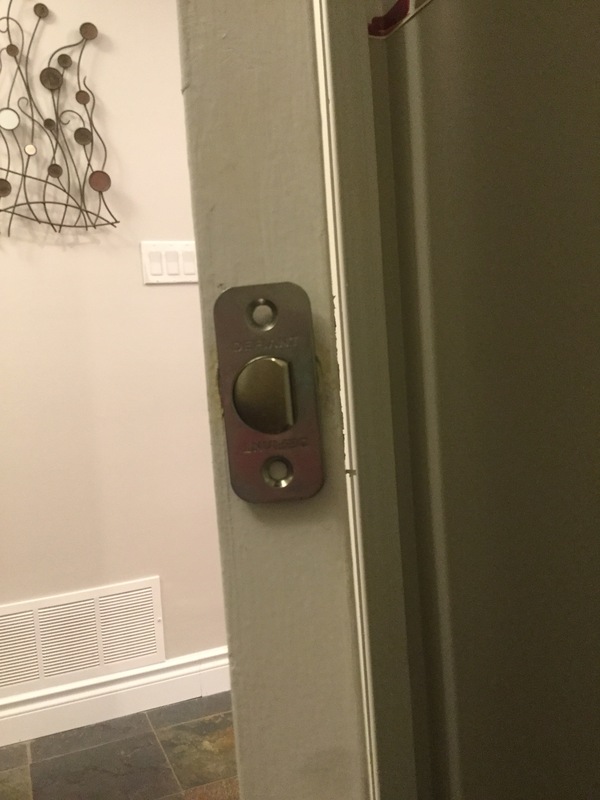 The last step is to replace the metal plate on the door jam. 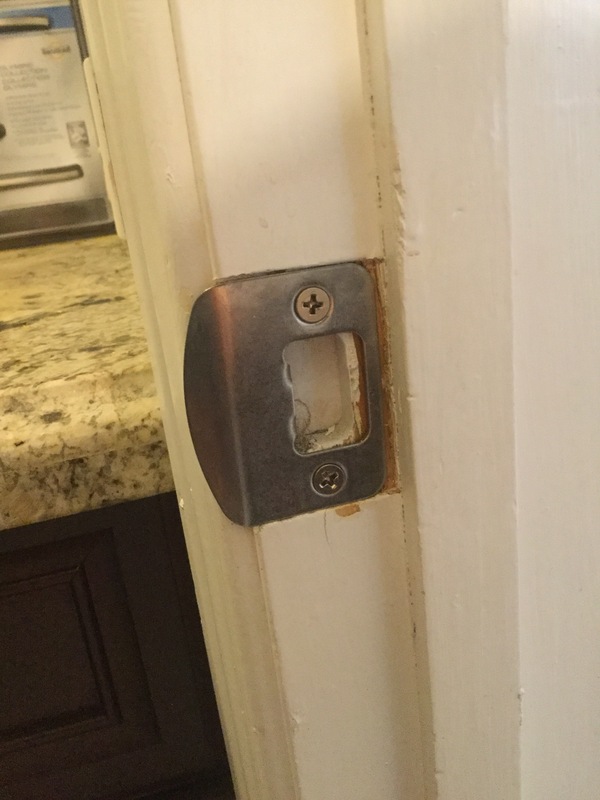 It just unscrews, then you add the two new screws, and shiny plate. So I obviously need to touch up the paint here, but I had to chisel this out a bit to fit the new plate in. So overall, I’m happy with the results. 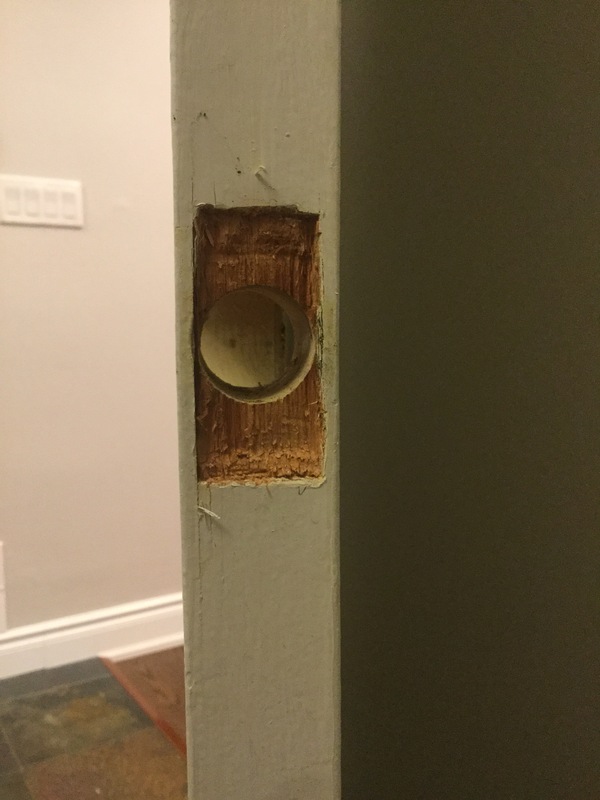 After spending so much on renovations, details like the baseboards and doorknobs make a difference. I would like to propose the link exchange deal with your website artzcool.net, for mutual benefit in getting more traffic and improve search engine’s ranking, absolutely no money involve. We will link to you from our Fashion and Women authority site – https://www.souledamerican.com/, from its homepage’s sidebar. In return you will agree to do the same to link back to one of our client site, from your artzcool.net’s homepage too (sidebar, footer, or anywhere on your homepage), with our brand name Harajuku Fever.